We've always been fans of local writer and freelance editor, Kim Piper Werker and so when we heard she had a new book out supporting her Mighty Ugly idea, we had to get ourselves a copy! Make It Mighty Ugly, Exercises & Advice for Getting Creative Even When It Ain't Pretty is a book unlike any other crafting book in that rather advising on making crafting visually appealing; Werker suggests making something "mighty ugly" with the premise of getting failure out of the way, making room for one's creative juices to flow, with only one way to go, which is up! A great book for anyone who creates or wants to (from writers, crafters, painters, etc. ); with a step-by-step approach using exercises that gently instruct readers to push their boundaries identifying strengths and weaknesses and encouraging readers to get their hands dirty, working though creative blocks, procrastination and finally sharing one's work. There are also plenty of tips and interviews with other creative types like Faythe Levine (Handmade Nation, The Sign Painter) and Kate Bingaman Burt to name a few, alongside stories from Werker's life which round out this inspirational guide illustrated by Kate Bingaman Burt. A great book to give to anyone who inspires to make. 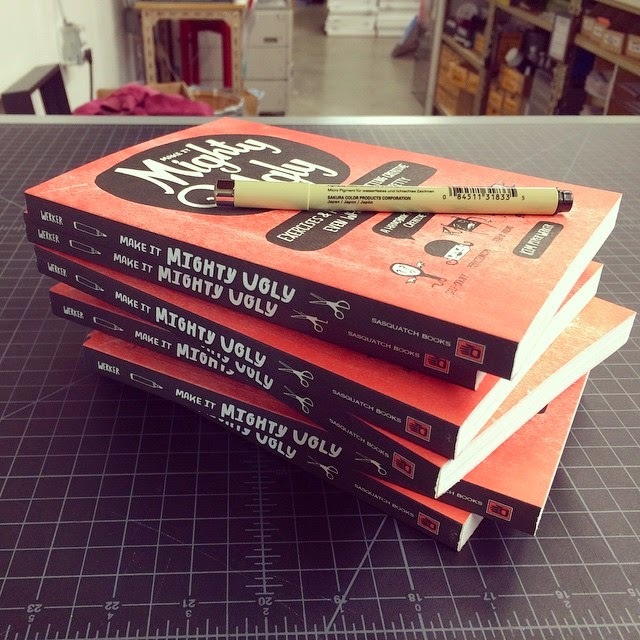 Make It Mighty Ugly: Exercises and Advice for Getting Creative Even When It Ain’t Pretty is available at most booksellers or order it online at IndieBound, Powells, Amazon, Barnes and Noble or Chapters. Thanks for sharing! seems interesting. And if you hurry, for the holidays, Kim's sending out and selling at cost, signed copies of her book. Hello creative friend's Christmas/Hanukkah presents!! "Hot cakes" and "a steal" are words to use here.